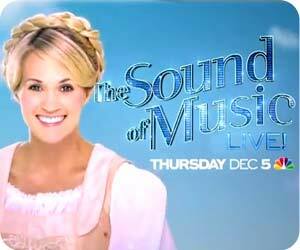 Carrie Underwood Plays Maria Von Trapp in the Sound of Music Live! Ask us about the Von Trapp Lodge in Stowe, Vermont or share your comments. To feature your Vermont business, contact us. The remake of the Sound of Music and the story of the Von Trapp family are in the entertainment news headlines again. This time with the exciting news of the NBC TV event airing Thursday December 5, 2013 of the Sound of Music Live! The starring role is featuring 6 time Grammy winner and season four American Idol champion, country singer Carrie Underwood. The original American version of The Sound of Music starring the legendary Julie Andrews and Christopher Plummer premiered in 1965. Andrews has praised Carrie Underwood and wishes her performance well. The real Von Trapp family of course operates the Trapp Family Lodge here in Stowe, Vermont. The Trapp Family Lodge is filled with one-of-kind memorabilia from the family’s private collection. Historical and entertaining photos and vintage Sound of Music movie posters may be seen on the wall of the inn. Their story has been filmed and acted out in many countries and in many languages over the years. However, many will only remember Julie Andrews as the face and persona of Maria Von Trapp. Visiting the Trapp Family Lodge you can experience the history with tours, airings of the Sound of Music each week, a visit to the grave sites of Maria, the Captain and many of the children that the movie made so famous. The hills of Stowe are really are alive with the sound of music in the summer with their outdoor concerts. For more information visit Trapp Family Lodge.